Welcome to this quiet and peaceful place right on the River Audna, where you can fish for salmon and other fish right on your doorstep. It offers cozy accommodation in a charming location right on the riverbank. The spacious living area of the house is divided as follows: entrance hall, hall with freezer, two bedrooms each with a double bed and a lounger, third bedroom with double bed, well equipped kitchen for self-catering, living room with comfortable seating and dining area next door (the fireplace can there not used!). In addition, spacious, modern bathroom with Jacuzzi and shower and second, older bathroom in the house. Outside there is a terrace with panoramic views of the River Audna. Here, the big fish walk up the river in front of the terrace! The house is beautifully quiet and secluded, surrounded by beautiful natural landscape, where it u.a. There are deer and moose to discover. 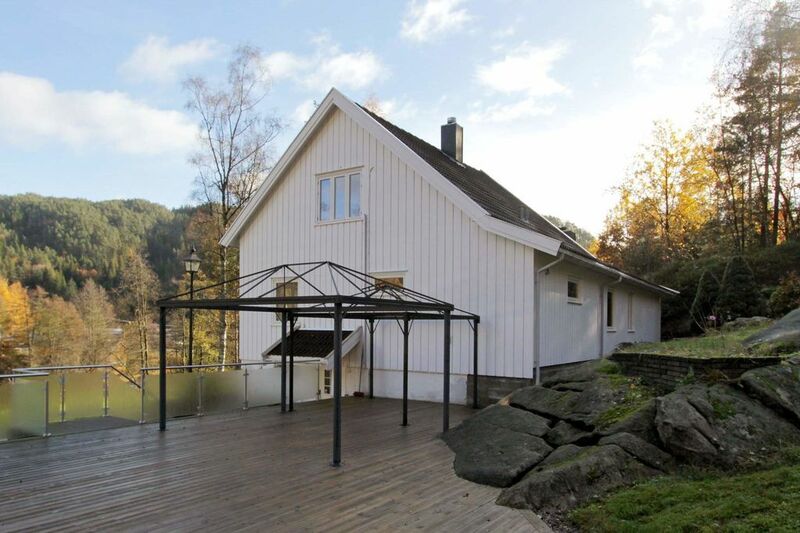 In the small town of Lyngdal you will find the popular fun bath Sørlandsbadet and the campsite Rosfjord Camping with hotel and the beach Rosfjordstranda. The Lyngna is one of the good salmon rivers in southern Norway, where you can try your luck during the season. In Kvås you will find the Southern Norwegian salmon center with a salmon ladder in the mountains, where you can watch the fish as they make their strenuous climb. A very special experience for every Petrijünger! So take a day off for this special destination, just a short drive from Gusa.